We hope our staff will be happy and fulfilled in their work as a contented team works better together and gets more back from what it puts in – helping to generate job satisfaction. We need the highest calibre of people to provide quality homes and services, so we work hard to create an environment which promotes learning, development and wellbeing and creates opportunities for individuals to achieve their personal potential. For further information see our Wellbeing commitment. 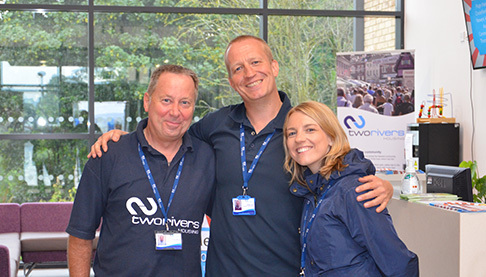 Everyone who joins Two Rivers starts with a comprehensive induction programme. This gives them the chance to meet managers and directors so they quickly gain an understanding of all departments, how their role fits with the wider organisation and how they can support its vision and values. One-to-one appraisals – regular opportunities for every member of staff to discuss their training opportunities and future plans with their line manager. Achieving excellence – all employees are trained in the internationally-acclaimed Mary Gober method of customer service, helping to embed strong communication and quality service throughout the organisation. Continuing professional development – the Two Rivers ‘learning environment’ includes conferences, professional courses with study leave, internal training and e-learning opportunities. Our own ‘Learning Group’ supports those who are studying and provides mentors if required. Secondment opportunities – giving staff the opportunity to grow their experience, whilst holding the option to return to their original post. Professional membership – helping staff stay up-to-date with changes in their profession. We firmly believe in helping people to learn through work and have had great success with employing apprentices and trainees across many departments, and in partnership with our external contractors. They have trained in office and manual skills and many of our previous apprentices found permanent positions with us when their training ended. Our work to support apprenticeships has even won awards. If you are interested in the apprentice and trainee opportunities at Two Rivers, please keep an eye on our ‘Vacancies’ page.